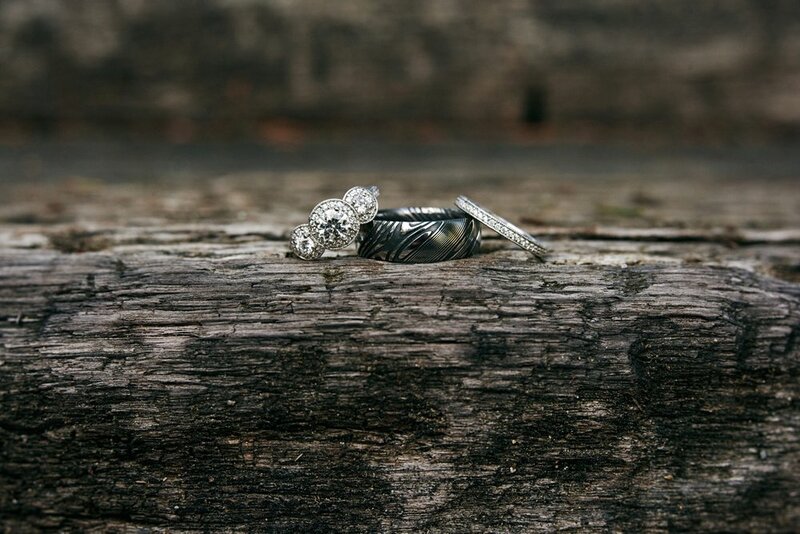 I loved all the rustic details of this wedding. What better way to emphasize a rustic barn wedding than by carrying that theme throughout the day? While they were getting ready, Laura and her bridesmaids wore oversized gingham button-up shirts instead of robes as they got ready. What a fun idea! I enjoyed hanging out with them as they prepared for the day and as Laura got her gift from Luke: a gorgeous pair of earrings. Once Laura was ready, we staged a first look with her dad outside. I love father daughter first looks! It was so sweet the way Laura embraced her father. There was so much sweet emotion in these photographs. Laura also had a first look with Luke. I love the excitement and anticipation on Laura’s face as she approached her soon-to-be husband. 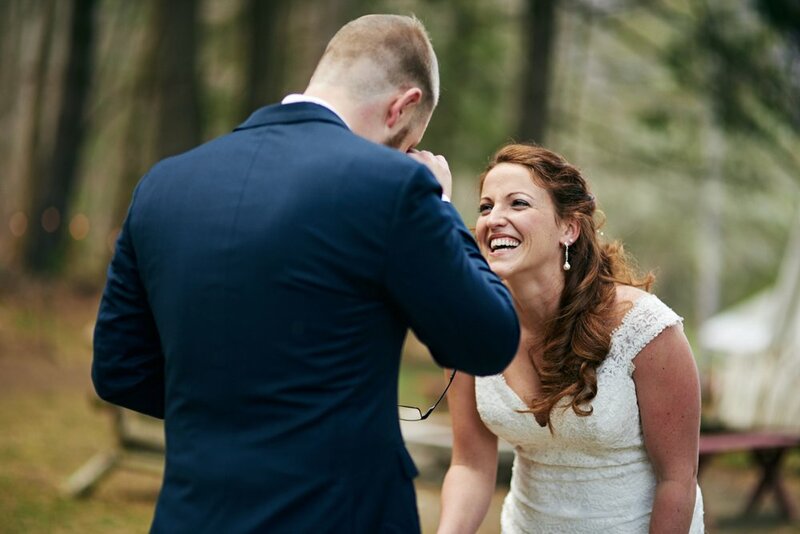 The happiness shared by these two during their first look set the tone for the rest of this spring wedding. Sheer joy was present in every moment. That joy continued through the formal portraits with the bridal party and family on the lawn of the West Mountain Inn. The smiles and laughter were infectious. The lovely, soft spring wedding colors of rose and navy were beautifully offset by the sunny sky and the mountains in the background. The views from the lawn were spectacular, and even though it was cold, it was still a beautiful day. 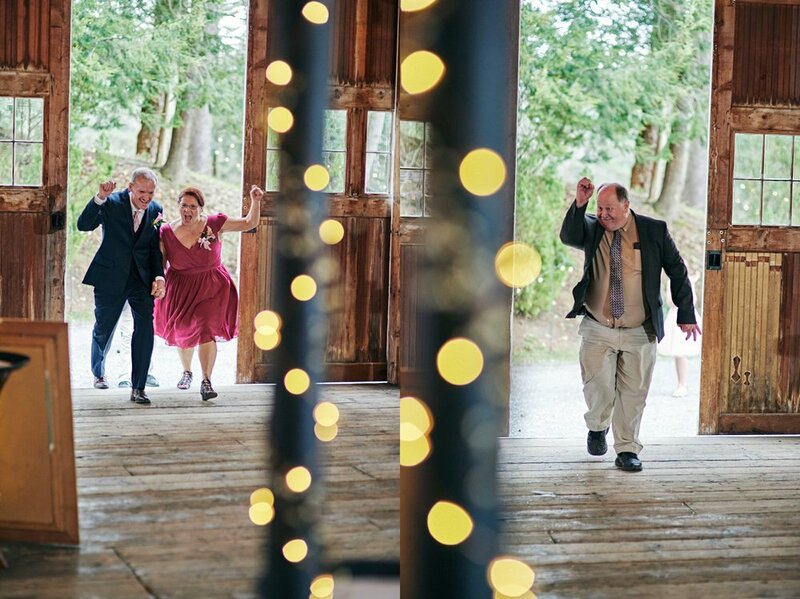 The West Mountain Inn truly is a beautiful venue for a rustic Vermont wedding! Nothing was blooming yet in the garden because it had been a very cold spring. But the outdoor ceremony in the Labyrinth Garden was still absolutely beautiful. You can’t always control Mother Nature, but when you have genuine love like these two have, you’re going to get amazing wedding pictures no matter what. Finally, we all headed inside for the reception. The introductions for the wedding party were full of fun energy. 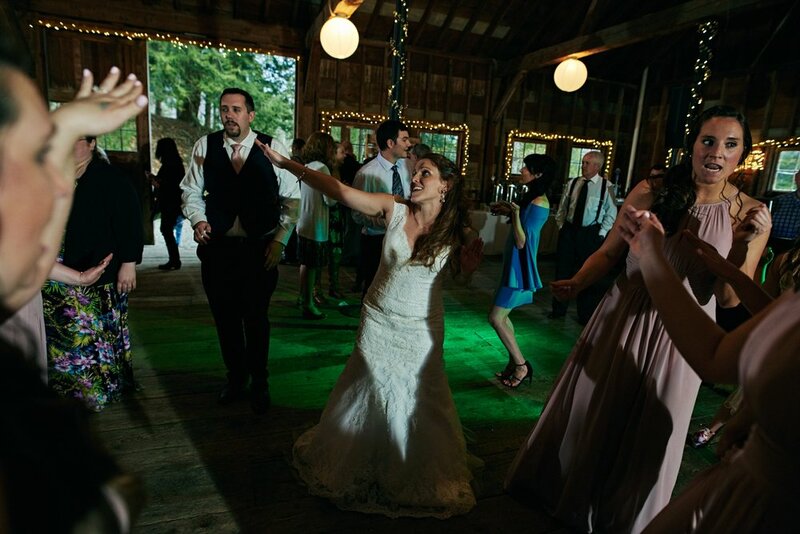 Instead of walking in, everyone danced into the reception. It was such a fun way to kick off the rest of the celebration! 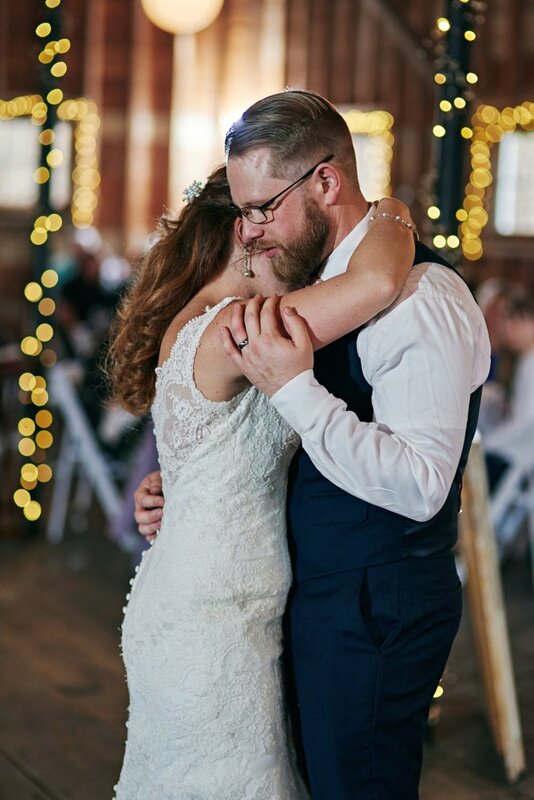 But when it was time for Luke and Laura to take to the dancefloor, it was like the rest of the world fell away as they shared their first dance. It had been raining constantly all weekend ahead of this wedding, but just as I arrived at the inn to get those “getting ready” pictures, the rain let up—and the weather stayed clear all the way up until the first dance. By that time, everyone was inside at the barn, so that worked out perfectly! You can try to plan ahead for the wedding, but sometimes, as I said, Mother Nature has her own plans—and even adds a little fun to the day by pouring rain during the first dance. 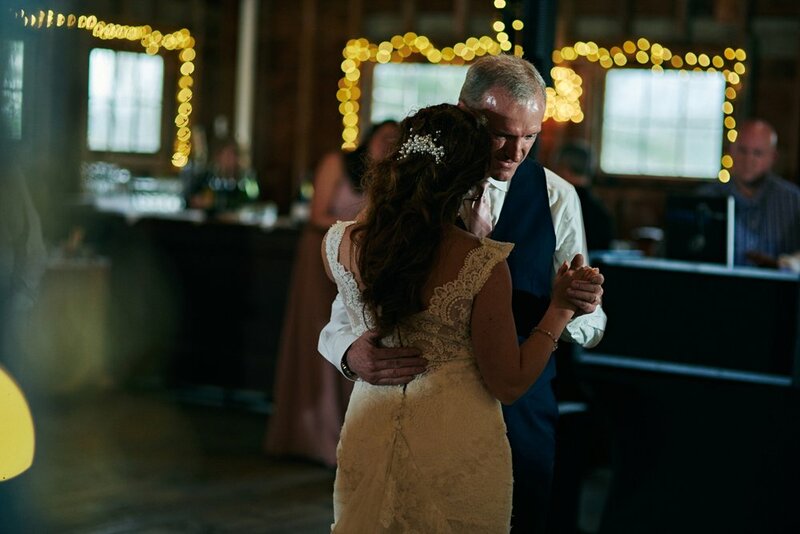 In fact, my favorite image of the day came right after the first dance when I convinced Laura and Luke to stand in the doorway of the barn and turn toward each other even as it was raining outside. I wanted them to remember the beautiful barn and the love they had for each other—and not the weather. Even while the rain fell, the reception and the fun continued. One of the most memorable moments was when Laura and her father shared their first dance. They started out traditional and then transitioned to a fun dance routine to the Sugar Hill Gang song “Apache (Jump On It).” I love when my couples do something like this—you’ll always remember this kind of silly fun! 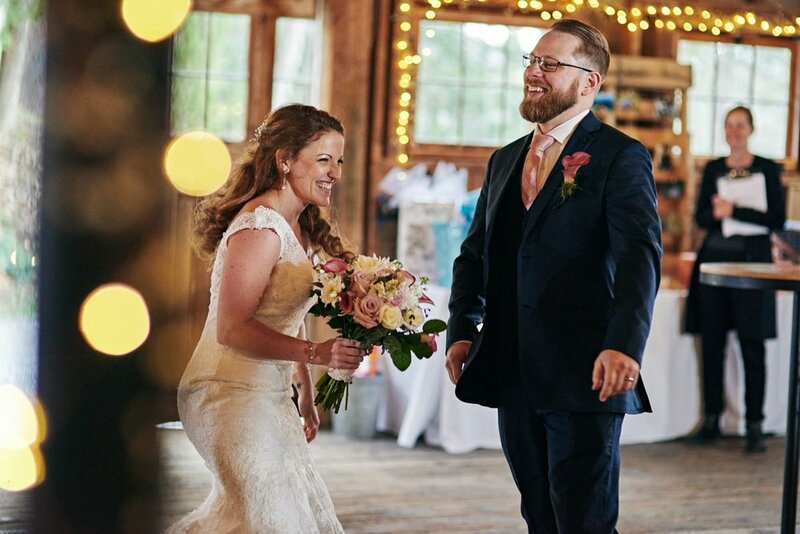 Rustic barn weddings always have a certain kind of warmth, but I can’t say enough about how the details in this wedding brought that feeling to the forefront of the day. There were wood centerpieces with baby’s breath, burlap, and a lantern. 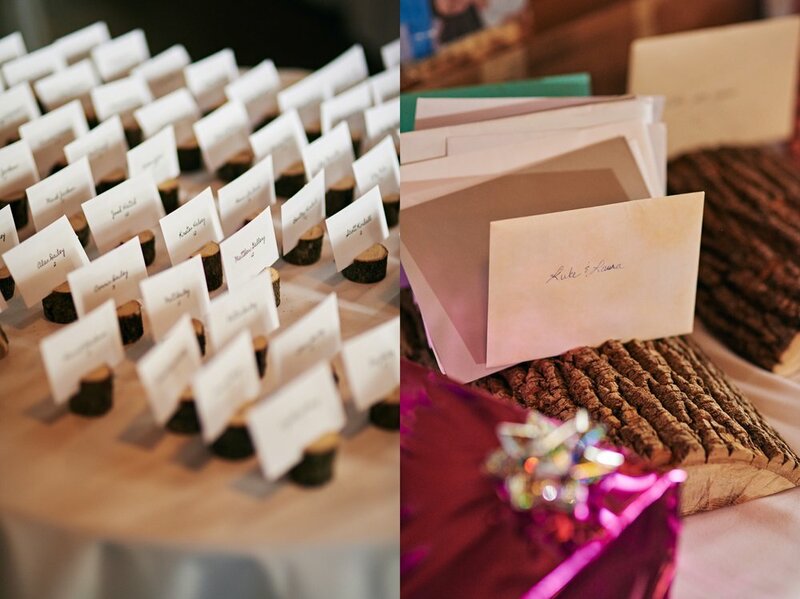 There were wooden place cards too—as well as a picture frame with wooden hearts inside it containing messages from the guests. The care and attention that they put into even the little things added to the overall atmosphere to the point that I keep coming back to the pictures of the details from that day and grinning. Those little touches really do make all the difference! I would like to thank first and foremost Luke and Laura for sharing their special day with me and letting me be a part of their beautiful wedding. I would also like to thank the fantastic staff at West Mountain Inn for being so wonderful and accommodating to my needs throughout the day.